Keeping the Dive Alive – Here is Ira Brooker. I’m nervous about Turf Club. The venerable Saint Paul music club has been closed for renovation for a couple of months now, with a re-opening slated for August 28. For Midway residents like myself, the club’s absence has made for an unsettlingly quiet summer on the local music scene. In the five years I’ve lived here, I’ve grown accustomed to strolling up University Avenue to catch a set at Turf Club at least two or three times a month, and often more frequently. Even when I don’t know any of the bands on the bill, it’s a comfortable, casual place to hang out, grab a Surly and take a gamble on finding a new favorite. That casual comfort has always been a big part of the Turf Club appeal for me. I wouldn’t call the place a full-on dive, exactly, but it certainly had some divey aspects: the rickety furniture, the dingy interior, the giant men’s room poster of Frank Zappa using the toilet (complete with a largely ignored “Please do not tag Zappa” sign). The downstairs bar and secondary performance area, known as The Clown Lounge, was farther still down the dive bar spectrum. With its crumbling booths and vintage decor of antique beer cans and hunting trophies, drinking in the Clown Lounge felt like having a few beers in your friend’s grandparents’ basement. 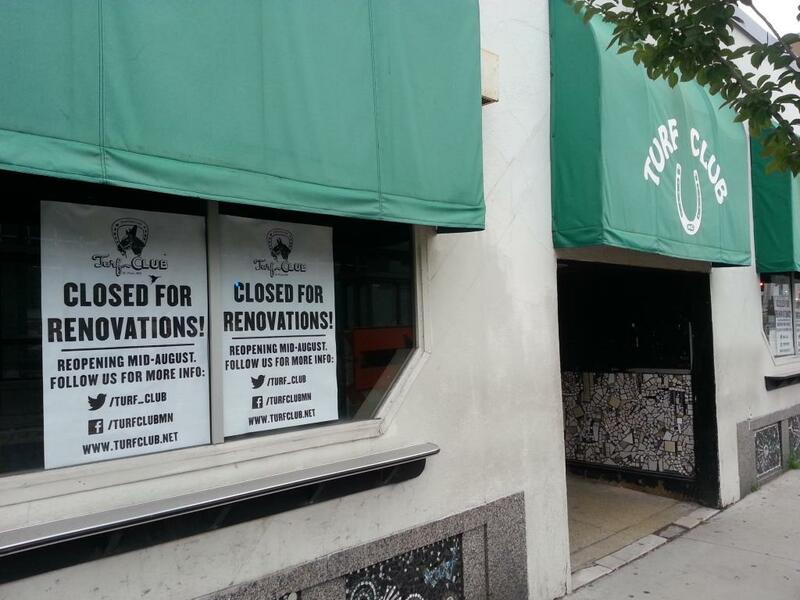 When First Avenue bought Turf Club a couple of years back, I was relieved that my favorite hangout would remain a going concern for the foreseeable future (I’d gotten pretty frantic when the place closed down for a few days in 2011 during a management shakeup). But I was also nervous that the change in oversight would mean a change in the spirit of a place I loved above most others. I venerate First Avenue and appreciate how much the place means to the Minnesota music community, not only as a venue but also as a paragon of competence and constancy. Even before they purchased the joint, First Ave frequently presented shows at Turf and brought bands to Saint Paul who might otherwise have stayed on the other side of the river. Still, no matter how many times they’ve partnered up, seeing a show at First Avenue or Seventh Street Entry has always been a very different experience from seeing a show at Turf Club. Krantz also assured me that the Clown Lounge will still operate as both a second music stage and a hangout spot, albeit with a number of similar upgrades. Turf Club is also getting food service (restoring an old kitchen area behind the stage that’s been used for storage in recent years), an accommodating green room (replacing a spare, dingy space in the basement) and a functional office, among other things. Moe: Everybody is going to family restaurants these days. Seems nobody wants to hang out in a dank pit no more. Carl: You ain’t thinking of getting rid of the dank, are you, Moe? Moe: Eh, maybe I am. Carl: Oh, but Moe! The dank. The dank! In the interest of accepting the things I cannot change, I’ve been trying to sort out why I cling so fervently to the dive aesthetic. It isn’t as if a grimy setting enhances the music in any way; as sound quality goes, it’s actually more likely to be a detriment. If I’m honest with myself, my taste for seedier venues smacks of privilege. It’s fairly obnoxious for a guy like myself with the means and access to attend top of the line performances to be complaining that the environs are too nice. Maybe I’m just a slumming hipster on a quixotic quest for “authenticity.” But the heart wants what it wants. Given the choice between seeing a band at a respectable joint like, say, Triple Rock or seeing the same band up the street at a dive like Palmer’s, I’m going downscale every time. Sadly, that’s getting harder to do. I’m ultimately fine with a bigger player like First Avenue reshaping Turf Club however it sees fit, because I know that without that intervention Turf Club might well cease to exist altogether. Just look at the local music dive casualties in the past few years. Station 4 shut down, leaving a swath of displaced headbangers in its wake. Big V’s continues as a bar but its stage is rarely occupied these days. The 400 Bar is shuttered and slated for a rebirth at the Mall of America of all places (forgive me for presuming the new incarnation will be somewhat less divey than the old one). Even saving a nice-but-niche space like the former Artists’ Quarter required intervention from the bigger-name Dakota. All of this is understandable, I suppose. There’s a lot of overhead involved in hosting live music. You can raise the cover charge, but once you get up in the $20 range, a lot of customers will understandably expect a certain level of nicety. That adds up to a no-win situation for dive venues trying to book touring bands, as many acts prefer to do their pre-show preparation in a space with as little visible water damage as possible. Still, it isn’t as if the Twin Cities music scene is totally devoid of options for those of us who like our shows with a side of grime. The Hexagon Bar remains a splendid showcase for local rock and punk acts. Well-weathered spaces like Palmer’s, Shaw’s and the Schooner Tavern, among others, offer genres from folk to roots to R&B. There’s still plenty of dive to go around, and there probably always will be. As for Turf Club, I’m certain I’ll adjust to the alterations before too long, even if the changes are jarring at first. The fact is it’ll continue to be my hangout so long as the doors are open and there are bands onstage. But deep down inside, I’ll always miss the dank.